Twitter polls bridge the gap between customers and brands, giving the latter insight into what the former wants and needs. To help you make the most of Twitter Polls, we’ve put together the following guide. Why should you use Twitter Polls? While you can, of course, pose a question to your customers through a traditional Tweet, a poll allows for a much easier and streamlined process for both you and your audience. As explained by Twitter, “Twitter Polls allow you to weigh in on questions posed by other people on Twitter. You can also easily create your own poll and see the results instantly.” Responding to a poll gives you a chance to share what you’re feeling with other Twitter users, while hosting a poll will provide valuable insight into what your followers think and feel. Now that you’ve seen some of the benefits of Twitter Polls, the next section will show you how to actually create one. To help you create your own Twitter Poll, Twitter provides this clear, easy to understand set of instructions. You can create your own Twitter Poll on the web or in the Twitter app (iOS or Android). 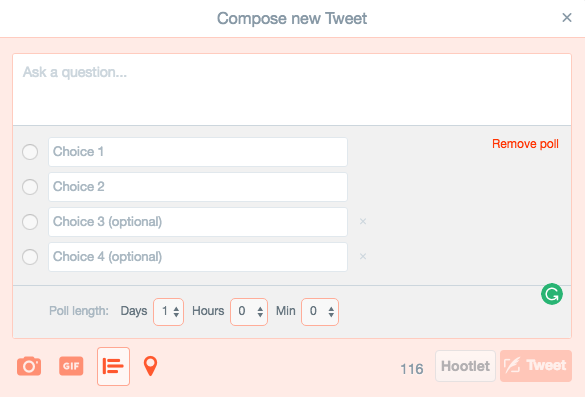 Click into the compose box at the top of your Home timeline, or click the Tweet button in the top navigation bar. Type your poll question into the main compose box. You can use up to 116 characters in your poll question. Insert your first poll option into the Choice 1 box, and your second poll option into the Choice 2 box. You can use up to 20 characters for each option. Your poll’s duration defaults to one day. You can change the duration of your poll by clicking one day and adjusting the days, hours, and minutes. The minimum amount of time for a poll is five minutes, and the maximum is seven days. Knowing how to create a Twitter Poll is the first step in finding polling success, but the following section will give you some actual ideas to try out. With the ability to ask any question, your Twitter polls are limited only by your own creativity. What are the questions you wish you could ask each and every one of your customers? What answers (choose up to four) will benefit your business the most? Think about these two important things, and try out any of the following ideas. One of the most effective ways of using a Twitter Poll, is to conduct market research. By asking the right questions, you can gain valuable insight into the habits of your followers. You can quickly find out what their pain points are, what they are looking for in a product or service, and what their preferences are. This is also an extremely helpful way to test the waters when developing a new product or service. As a social media and content marketer, there aren’t many things more important to you then what your audience thinks of your efforts. Are they enjoying the content you create and post? What would they like more of? What could they do without? As EConsultancy explains, “Using polls in this way enables you to ask your Twitter audience a direct question about what they actually want from you, and then you’ll be in a better place to give it to them.” While you, of course, can and have been paying attention to what your audience responds to, this takes more time and effort that the quick and direct use of a Twitter Poll. A thoroughly researched piece of content, such as a blog post, is going to build brand loyalty and establish your organization as an authority on a topic—which will undoubtedly impact whether you receive positive or negative feedback. This is where Twitter Polls can come in handy. Use a Twitter Poll to ask your audience a question you are looking to answer with your content. If you are writing a blog post about a topic, ask your audience a relevant question. Whether you get the answer you wanted or not, you’ll have some interesting insight to add to your post. Our previous post on Twitter Polls used a great example from The Nieman Lab who polled their audience asking about their use of ad blockers. They then embedded the poll in a blog post and wrote about their results. We're curious: do you use an ad blocker? Twitter Polls are a great way of engaging with your community, especially through industry-related questions. In doing this, you have the opportunity to spark conversations amongst participants, attract the attention of other industry leaders, and build credibility. Asking questions related to your industry, but not specific to your brand, shows that you care about more than just marketing your own product or service. With this comes trust, customer loyalty, and the opportunity to build valuable relationships. Your audience members follow your brand for a reason, so speak to their interests. On Twitter, timeliness is king. If there’s a current event, trending pop culture phenomenon, or viral video, try to incorporate a reference to these events with a Twitter Poll—but only if it’s relevant to your brand and voice. For example, when ‘The Dress’ was all the rage, companies and brands took to Twitter to ask their followers what color they thought it to be. I’m not suggesting you jump on every single internet or cultural phenomenon, but on occasion this is a great way to show that you are on top of trends, while attracting new audience members through relevant hashtags. Asking questions has always been a great way of getting your audience to interact with your brand and organization. Engagement is one of the most important parts of any social media strategy, and Twitter Polls offer a seamless way to encourage high-quality connections with your community. Engage your Twitter community with Hootsuite.